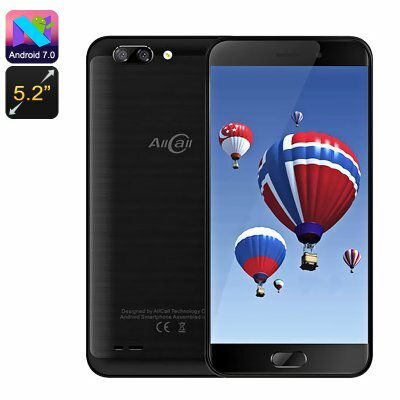 Successfully Added AllCall Atom Smartphone - Quad Core CPU, 2GB RAM, Android 7, Dual SIM 4G, 5.2-Inch Display,Dual Rear Camera (Black) to your Shopping Cart. The AllCall Atom Smartphone has a quad-core CPU and 2 GB of RAM, running on the Android 7.0 OS it brings a smooth user experience and at an affordable price. With 2 SIM slots each supporting 4G you can connect to the fastest cellular data services and enjoy quick downloads. This will support streaming of HD movies or online mobile gaming. This stylish phone has a 5.2 Inch screen and fist comfortably in the hand. With 720p resolutions, it's a delight for movies and games. A 2100mAh battery lets you enjoy up to 4 hours of continuous use which should see you through a typical day of usage.